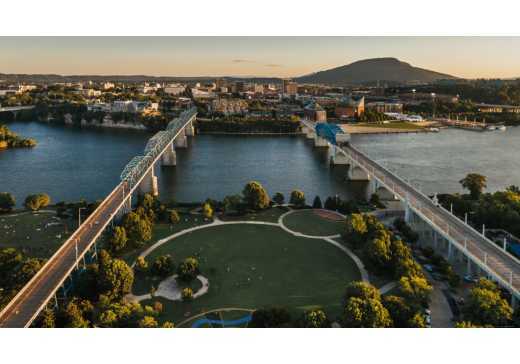 By this point, you’ve probably heard from plenty of people just how great Chattanooga is. In the past two decades, it’s blossomed into one of the most vibrant cities in the Southeast and has even managed to be named “Best in the U.S.” by Lonely Planet and Best Town Ever by Outside Magazine twice. Yada yada yada. Combine those accolades with its location in the heart of the beautiful Cumberland Mountains, and you might think you understand what all the buzz is about. Well, we’d like to set the record straight. Frankly, Chattanooga isn’t all it’s cracked up to be, and there are some serious issues to take into account as you plan your vacation. Read on to learn why a trip to the Scenic City can become a dilemma. Did you bring your appetite to Chattanooga? Well, you’d better send it back home because choosing between all of the fabulous local restaurants borders on impossible. Should you have a gourmet burger on a locally baked bun at Tremont Tavern? Or fresh sushi at Totto on Northshore? What about a trendy weekend brunch at Stir? No sane person can have an easy time deciding where to eat in a city with so many incredible options. Over the past few years, breweries have sprung up on seemingly every corner in Chattanooga, and they all bring a special flair to their beer. Sure, you could sip a classic Chattanooga IPA at Big River, enjoy a Southsidenstein stout at the Terminal, or branch out with a habanero-infused beer at Chattanooga Brewing Company. But really, why would anyone want to spend their vacation wandering around town sampling fantastic local brews made by passionate people in unique atmospheres? That just sounds unbearable. We know how much you love calling an Uber or Lyft and then spending precious vacation time standing on a curb craning your neck to spot a tiny Honda Civic. Which is why we’re sorry to say that you might not even need to open your rideshare app during your visit to Chattanooga. The Walnut Street pedestrian bridge connects two major parts of downtown, the Bluff View Art District and Northshore, making the city exceptionally walkable. And if you want to go a little farther, like to the Southside? Sorry, still no cab necessary. Simply hop on a bike from the affordable and easy-to-use bike-share program and easily pedal across town. One of the best parts about experiencing the great outdoors is waking up at the crack of dawn and driving several hours to the nearest trailhead while getting lost, losing cell service, and cursing at your hiking partner multiple times along the way. So you might be disappointed to learn that you can enjoy dozens of beautiful outdoor experiences within just a few minutes’ drive of Chattanooga. Got an hour to spare? Visit Stringers Ridge on the Northshore for one of the best overlooks of the city. Have a whole afternoon? Make the 20-minute drive to Lookout Mountain and hike just over a mile for sprawling views from Sunset Rock. Or make your way to Signal Mountain to check out Signal Point, which overlooks the impressive Tennessee River Gorge. The car rides to these spots are so short that you won’t even get to enjoy your favorite pastime of fighting over the Spotify playlist. Everyone knows what a great feeling it is to pay a whole lot of money to go see a super famous attraction only to find out that it’s completely and utterly overrated. Unfortunately, Chattanooga is unable to provide that sought after money-down-the-drain feeling, because our widely known local attractions actually are awesome. The stunning maze of Rock City is a favorite for all ages, and that whole “seeing seven states” thing? It’s not just a rumor. And we hate to break it to you, but the Tennessee Aquarium is pretty phenomenal, too. It’s fun, educational, and awe-inspiring for adults and kids alike, and you’re sure to leave without even a hint of buyer’s remorse. You might as well strap that camera to your hand because you can hardly turn a corner in Chattanooga without stumbling upon something Instaworthy. Do you want your new profile pic to feature a giant painting of flying donuts? Check. Been dreaming about a mural that literally takes up an entire city block? Yup. What about a Boomerang of you doing a cartwheel in a grassy meadow surrounded by sky-high abstract sculptures? Yeah, we’ve got that, too. Your followers won’t know what hit them and your inbox will pile up with people wanting to know, “Where is this?” But hey, that’s the price you pay when you visit a city as photogenic as this one. We’ll be honest. Returning to your own city after a Chattanooga getaway is probably going to be a bit disappointing. You might awaken in the night to flip through trip photos or find yourself endlessly regaling your coworkers with every glorious detail of your weekend. You may even have the urge to call the Chattanooga Visitors Center and hang up when they answer the phone. If you do find yourself experiencing these withdrawals, don’t worry. The cure is simple: start planning your next trip to Chattanooga.